The Project involves the development of a 15-floor high-rise project containing a 258 room full service, luxury hotel. IMPORTANT DISCLOSURE – PLEASE READ: EB5 Diligence and its principals have provided the information herein in connection with the research services offered for private placements and other similarly structured investment vehicles claiming exemption from registration from the Securities Act of 1933 through Regulation D, each of which was created for the purpose of facilitating specific immigration objectives of potential investors (“EB-5 Investments”). Neither EB5 Diligence nor its principals and agents, including but not limited to any broker-dealer with which principals of EB5 Diligence are associated under the rules of the Financial Industry Regulatory Authority (FINRA), are offering, recommending, selling or placing, nor intending to offer, recommend, sell or place EB-5 Investments through making known the availability of research on such EB-5 Investments on this website. EB-5 Investments may only be offered or placed through use of a suitable offering document by senior management of the issuer or through others who are appropriately registered with a broker-dealer provided to an appropriately accredited or qualified investor as provided by law. Research reports provided by EB-5 Diligence are not annexes or supplements to any offering documents of EB-5 Investments, nor may they be construed as such. Notwithstanding, EB-5 Diligence and/or its principals may be compensated by issuers, prospective investors or others affiliated with EB-5 Investments in consideration for the provision of research reports on EB-5 Investments. EB5 Diligence will disclose its compensation from issuers of EB-5 Investments to those utilizing its research reports upon request. 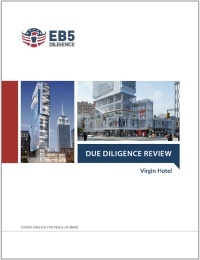 As such, investors and others should be aware that there is an inherent conflict of interest between EB5 Diligence, its principals and issuers on the one hand, and investors on the other hand, given the nature of compensation paid to EB5 Diligence and/or its principals and the perceived objectivity of research reports on EB-5 Investments under such circumstances. Neither EB5 Diligence nor its principals and agents make any express or implied warranties whatsoever on this website regarding the suitability of EB-5 Investments. Usages of any references to laws or regulations by EB5 Diligence on this website are for informational purposes only and are not intended in any manner whatsoever to state or imply that EB-5 Investments are warranted in any manner by any governmental body of any kind. EB-5 Investments may differ from customary investments in that their primary goal may not be driven by investment returns but instead stated immigration objectives. As such, EB-5 Investments bear substantial financial and legal risks, including the loss of principal and/or immigration opportunities. Investors are directed to refer to the specific risk disclosures provided to them in connection with the EB-5 Investments under consideration, as well as guidance from independently retained accounting, legal and financial services providers.